FLOW is an event series produced by the Coaction lab in association with the Intermedia MFA and New Media undergraduate programs at the University of Maine and in collaboration with the Friends of Fort Knox. This event series is focused on water as a precious resource that connects and supports the diverse range of living systems on our planet. This year’s event is in collaboration with Intercreate.org, host of SCANZ 2017 Ocean + Energy an international biennial. Intercreate explores projects at the juncture of art, science, culture and technology. The first SCANZ event was held in 2006, and there are other events this year in New Zealand, Australia and Japan, with a final second New Zealand wrap up event in December. 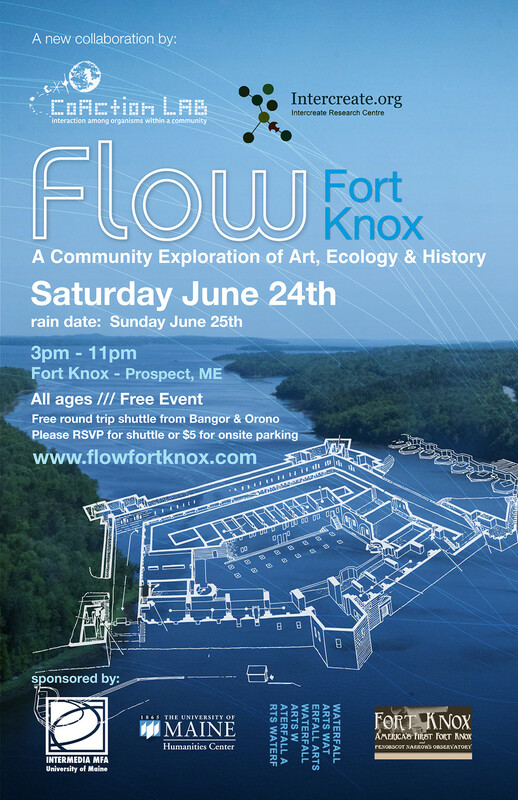 Last year’s FLOW event took place at the Thomas Hill Standpipe in Bangor ME and this year’s FLOW Fort Knox event will take place on June 24th 2017 at the historic Fort Knox and Penobscot Narrows Bridge and Observatory in Prospect ME, across the Penobscot river from Bucksport ME. This event has been sponsored in part by grants from the University of Maine College of Liberal Arts & Sciences, the Cultural Affairs/Distinguished Lecture Series Fund and the University of Maine Humanities Center. Fort Knox, a civil war era fort that never saw battle, serves as a truly inspiring subject with it’s rich history near the mouth of the Penobscot bay. The Penobscot river is the longest and most extensive river in the state of Maine and is home to the Penobscot Nation. We will creatively explore the deep roots of this historic site as well as the unique architectural features of Fort Knox and nearby Penobscot Narrows Bridge and Observatory, all with an ecological focus in mind. An array of artists, scientists, historians and local cultural groups have been invited to participate and collaborate to create a multi-sensory / multi-perspective experience. Sculpture, Installation, Performance, Sound, New Media, Projection Mapping and many other hybrid art forms will be included in FLOW 2017. This event is free and open to all ages. There will be a free bus / shuttle from Orono and Bangor to and back from Fort Knox in Prospect, ME. Shuttle details and an RSVP system will be announced soon.